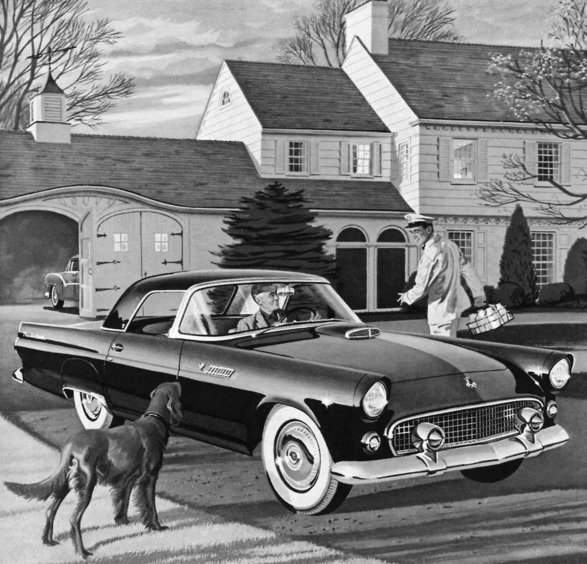 Over the years the Ford Thunderbird has earned its place in U.S. history as an icon of automotive technology. 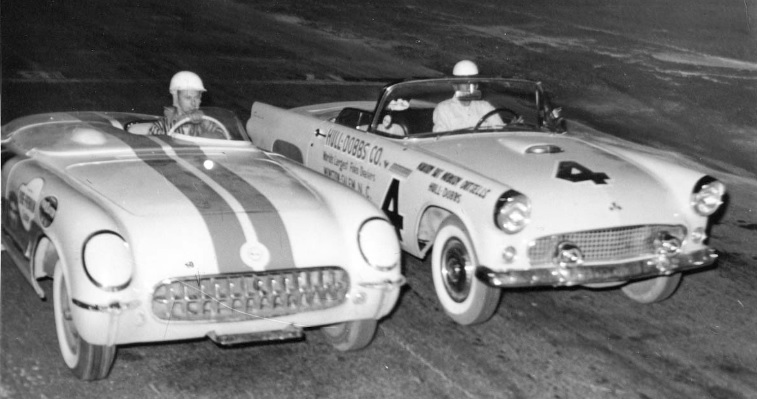 When the Thunderbird was introduced in 1955 it was intended to compete with the Chevrolet Corvette. It was a two-seat car with clean styling, creature comforts, and V8 refinements. In 1958 the Thunderbird was transformed into a four-seat car. It had much boxy lines, a wide-pillar roof, and was classified a personal luxury car. Although the 1955-1957 two seat roadsters had been very popular, many people wanted the convenience of a car with more passenger and cargo room. The revamped Thunderbird was an instant success, and it was named Motor Trend Magazine’s Car of the Year. 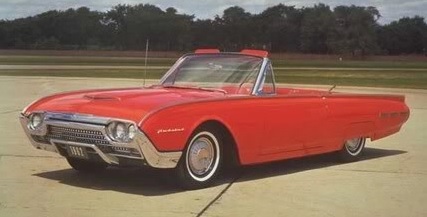 From 1958 through 1960 the Thunderbird could be ordered with either a 352 cubic-inch V8 engine that put out 300 horsepower or it could be ordered with a huge 430 cubic-inch engine that put out 350 horsepower. In 1961 the Thunderbird went through yet another restyling and the all-new body shell featured a pointed front nose, modest fins above the traditional round taillights, quad headlamps recessed in oblong housings, and much softer roof lines for the hard-top versions. The interior featured a dash that curved at its outboard ends to blend in with the door panels, and the first ever “Swing Away” steering column. The 1961-1963 T-bird had a 390 cubic-inch V8 available and it put out 300-340 horsepower. The next body re-styling came in 1964. It was known as the “Jet Bird” model line. The wheel base was lengthened to 113 inches and the overall length of the car was 205 inches. This new body style consisted of shorter roof lines, a newly designed rear-end, and a longer hood and rear deck lid. The convertible option was still available during the ’64 model year, however, the Sports Convertible option was officially dropped from the lineup. In 1965, the Thunderbird changed cosmetically with a reversed scoop behind the front wheels and a different front end. Available for the first time were power front disc brakes. 1966 saw more cosmetic changes such as a new grille, a single tail-light that ran the width of the back of the car, and new body sculpting. Also new for 1966 was the 428 cubic-inch engine, which was available as an option along side the standard 390. The 1967 Thunderbirds were very different from their predecessors. With an all new chassis design a 4-door option became available. Also changed was the grille and headlight layout, which were designed to appear like a jet engine intake. The headlights on these models were concealed until the headlight switch was turned on. The four-door model had rear “suicide” doors. The engine options available were a 315 horse 390 cubic-inch V8 and a 345 horse 428 cubic-inch V8. The convertible option was dropped from production in 1967. The only real difference in 1968 was a new grille which featured small Thunderbird emblems attached to each of the retractable headlight doors and a new 360 horse 429 cubic-inch V8 engine option. In 1969 the grille and the taillight assemblies were the only real changes. The single taillight was replaced with two taillights that had a thunderbird emblem located to the center. Also, a sunroof option became available. The only engine available for the 1969 Thunderbird was a 360 horse 429 cubic-inch V8. 1970 saw still another body change. New sheet metal and a V’d front grill. The Thunderbird still had concealed headlights and it still came in a two or four-door version. The 1971 Thunderbird was basically the same except for a redesigned front bumper and grill. A new generation of luxury emerged with release of the 1972 Thunderbird. Available only as a two-door hardtop, the emphasis was on styling and comfort and the interior took on a much more luxurious tone than the earlier Thunderbirds. A standard 429 cubic-inch engine powered this 4,596 pound vehicle down the road is style. The 460 cubic-inch V8 was available as an option. 1973 saw small cosmetic changes such as an “egg crate” styled grill and dual headlights. An opera window was also available. 1976 Ford Thunderbird The 1974’s had just a few little differences from the ’73 model. One difference was a change in the standard engine. The 460 cubic-inch Lincoln V8 was now the power plant of choice. 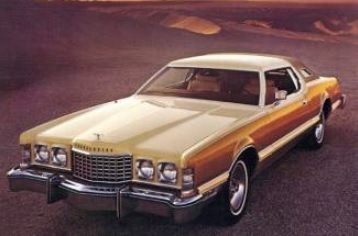 The 1976 Thunderbird was the biggest and most luxurious Thunderbird ever. Downsizing to a mid-size platform in 1977 lightened the Thunderbird almost 1000 lbs. 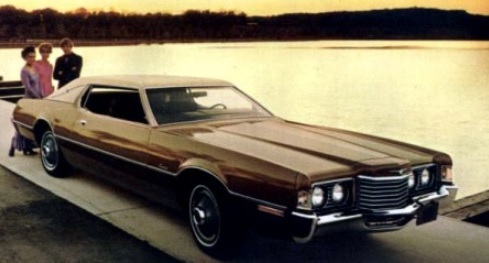 In spite of the fact that it was also almost a foot shorter it retained most of the interior of the 1976 model. The somewhat smaller and lighter car made use of the 302 cubic-inch V8 as the standard engine while a 351 V8, and a 400 V8 were available as an option. In 1978 the Thunderbird added a T-top option. The 1979 Thunderbird was the same body but it had a redesigned grill and two individual tail lights instead of one wrap-around taillight. The 1980 Thunderbird was converted into a uni-body framed car. It weighed 800 pounds less than the ’79 and it was 17 inches shorter as well. It was available with either a 255 V8 or a 302 V8 with overdrive. In 1981 the Thunderbird was available with a 6-cylinder engine and in ’82 it was offered with a V6, an inline 6 and 255 V8. The V6 engine boosted gas mileage to a record 30 mpg. on the highway. 1983 was a monumental year for the Thunderbird. The new Thunderbird featured an aerodynamic look and a 3.8 liter V6 power plant. In February of 1983, Ford sweetened the pot when it unveiled the Thunderbird Turbo coupe. The release of the turbo coupe turned a lot of heads. The car was available only with a 2.3 liter, turbocharged four-cylinder engine mated to a five-speed manual transmission. At the same time the turbo coupe was introduced, Ford also added the 5.0 liter V8 model. The only changes in the 1984 Thunderbird were the addition of the FILA and Elan models to complement the Turbo coupe and the standard models. The 1985 Thunderbird received a newly designed gauge cluster and a new seating arrangement. On the outside it received a redesigned front grille and tail light assemblies as well as a new Thunderbird emblem. The 1986 Thunderbirds saw the addition of an eight-injector port fuel injection system on it’s 302 engine and for safety, a third brake light. The 1987 bird was aerodynamically restyled and had a redesigned front end that featured flush-mounted headlights and a new grill. As a result of redesigning, the roof line was swept back, the rear deck-lid was raised, and the taillight were redesigned. Other changes included the dropping of the Elan model and the release of the Thunderbird Sport and the Thunderbird LX. The Thunderbird Turbo coupe was still the top of the line and was putting out an awesome 190 horsepower when outfitted with the five-speed manual transmission and 150 horsepower when outfitted with an automatic. A completely new Thunderbird hit the streets in 1989. A longer wheel based, wider stance Thunderbird would now feature a new independent rear suspension. The overhauled design offered only a 3.8 liter V6 engine with no optional engine except in the Super Coupe. The three models available for ’89-90 were: Thunderbird, Thunderbird LX, and Thunderbird Super Coupe. The Super Coupe featured a 215 horsepower Super-charged V6 with dual exhaust, four-wheel disc brakes, and special side and rear end ground effects treatments. 1991 offered a 302 V8 option to replace the 3.8 V6. In 1992 the Thunderbird LX and base Thunderbird received redesigned front bumpers and a full-width taillight. 1993 saw Ford drop the Thunderbird Sport and base Thunderbird models. In 1994 Ford made some Aerodynamic changes to the front end by giving T-bird a new hood, head lights, and bumper design. The 1994’s also received a major interior change and the horsepower rating of the Super coupe was boosted to 230 from 215. Ford also found a replacement for the 5.0 liter V8 engine …. a 4.6 liter V8. Exterior changes such as a revised nose that featured a smoother front bumper came in ’96. The 1997 saw more revision to the nose and a general smoothing out of the fender lines. It was felt by many, that 1997 was to be the last model year for the Ford Thunderbird. This feeling was reinforced when the 1998 model year found the showrooms across globe bird-less. As Ford was pulling the Thunderbird from the showroom floor, there were murmurings that they were planning to continue the line with a completely new version for the new millennium. The All New 2002 Thunderbird features modernized design elements from the ’55-’57 and ’61-’62 Thunderbirds. These elements were to include port-hole windows, a hood scoop, rounded headlamps, tail lamps and fog lamps, and the Thunderbird’s trademarked badging. The concept car which was originally deemed the “2001 Thunderbird Concept,” is now in production and it has everyone talking. So much so, that Motor Trend Magazine named the all new Thunderbird the Motor Trend Car of the Year for 2002. In 2005 the Thunderbird tradition came to an end. Like the Mustang, this popular line of Ford automobiles is surely one of America’s most treasured classics and will be for many years to come.